Back in December we went over to Tasmania to shoot the first of the new Rapha Continental films. Riding around Tasmania was one of those things that's quite easily achievable for us in Melbourne, but there's always something bigger, better or more important to do. Some call it "proximity syndrom", I call it "way overdue". After some lengthy planning meetings with the film crew we set out to make a character out of Tasmania in the movie. It was risky because I didn’t want to end up with a movie that simply showed pretty pictures of Tassie, but I couldn’t imagine how else it could be done. There are some fascinating things about Tasmania’s past and it’s nature and trying to capture that five minutes would be a challenge. The riders in this film literally got to carry out one of my dream trips; To ride down to the end of Beach Road, hop onto the Spirit of Tasmania, and sail across the swells of the Bass Strait, and spend three days riding the less travelled roads of Tasmania. There were ten of us in total. The six riders were Alan Iacuone (Alby), Anthony Fewster (Fewey), Ben Hegerty (Heggers), Steve Knight (Steve Pete Day Knight), Daniel Strauss (Straussy) and Mark Stoner (Marco). Also with us were Joel and Nicko who filmed, directed and produced the film. Last but not least was Carrick Whitney, Rapha’s COO and all around good kiwi bloke who was passing through to his homeland for Christmas and thought he’d jump onto this junket. The rides passed through places that seemed so remote and we must have looked like aliens to many of the locals who were always curious to speak with us. I could write a book about all the places we visited but one of the highlights of the trip for me was unfortunately not captured on video or stills. On day two we were driving from Straughn to the mining village of Queenstown. It was pouring rain so hard that morning that it was impractical for filming so we had to drive through the area. I’ve never seen anything like the approach into Queenstown. The landscape was as barren as the moon and even the footie pitch was made of gravel. The rain was coming down so hard that water flowed down the switchbacks like a river. The sun poked its head out as we came into Queenstown and we could see this orange glow and silhouette of scattered homes and mines on the hilltop in the cloud. It was one of the eeriest and most surreal sights I’ve ever seen – this village in the middle of nowhere which looked like a ghost town, but knowing that hundreds of people were a kilometer under the ground working away. What an incredible weekend it was. One of my favorite things that cycling gives me is the ability to continue acting out my 20′s and go out on roadtrips with my mates. Whether it be a bike race with my team or a weekend away discovering new roads, I’ll always have this legitimate reason to escape from reality and keep feeling young. Over a few drinks on the Spirit of Tasmania the stories of our past cycling careers got grander with every pint consumed. Jack Kerouac, A Lost Love, Pink Floyd, Johnny Cash, Bicycles? Dosnoventa is a bicycle company located in Barcelona, Spain. They make bikes. So what does Jack Kerouac, a lost love, Pink Floyd, and Johnny Cash have to do with a bike company? Well, they also made a short film. Watch it. "I have lots of things to teach you now, in case we ever meet, concerning the message that was transmitted to me under a pine tree on a cold winter day. It said that Nothing Ever Happened, so don't worry. It's all like a dream. Everything is ecstasy, inside. We just don't know it because of our thinking-minds. But in our true blissful essence of mind is known that everything is alright forever and forever and forever." Close your eyes, let your hands and nerve-ends drop, stop breathing for 3 seconds, listen to the silence inside the illusion of the world, and you will remember the lesson you forgot, It is all one vast awakened thing. I call it the golden eternity." We were never really born, we will never really die. It has nothing to do with the imaginary idea of a personal self, other selves, many selves everywhere: Self is only an idea, a mortal idea. That which passes into everything is one thing. It’s a dream already ended.There’s nothing to be afraid of and nothing to be glad about. I know this from staring at mountains months on end. They never show any expression, they are like empty space. Do you think the emptiness of space will ever crumble away? Mountains will crumble, but the emptiness of space, which is the one universal essence of mind, the vast awakenerhood, empty and awake, will never crumble away because it was never born. "Dosnoventa was founded in the city of Barcelona, as the result of the interest of two old friends and well-known city riders, lovers of quality products and with a large professional experience in the world of the fixed wheel. The synergy that bonds them is what spurs them to the production of bikes, for themselves and for their friends, with the mission of offering their crew a great product using the best materials, with a very studied aesthetics, geometry and image, built by the best craftsmen but with a very competitive price. " A designer has an idea of how to make drivers take more caution around cyclists: Help them see bikers as people, not obstacles. When London started adding more bike lanes, more commuters started cycling to work. But if you watch the city streets at rush hour, you'll notice something: Almost all the cyclists are men. British women are four times less likely to ride. The same trend happens in the U.S., where only about a quarter of regular bike commuters are female. 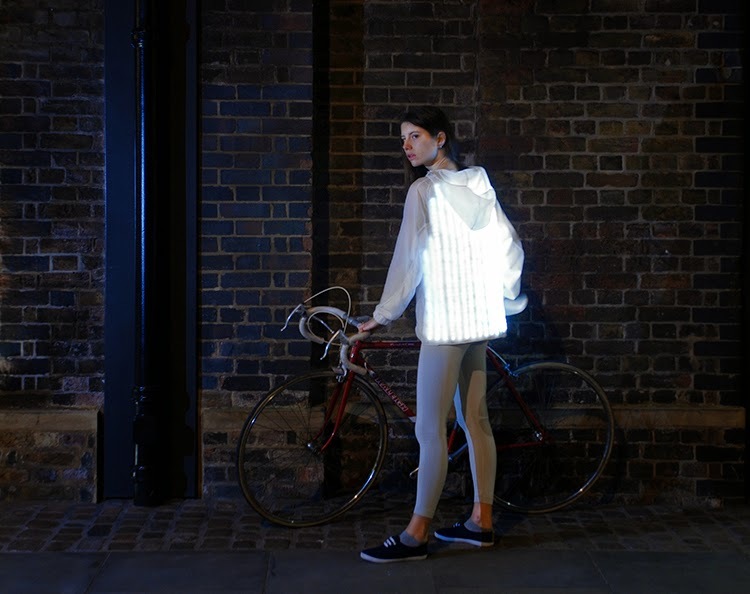 A new jacket, designed by London-based designer Will Verity, is intended to help get more women riding by tackling their main concern--most just don't feel safe weaving through cars and trucks in heavy traffic. Rising Canadian squash star Adrian Dudzicki was murdered yesterday by Aleksey Aleksev, while riding his bicycle to practice in Toronto. The weapon was a 1992 BMW 325; Aleksev has been charged with dangerous driving causing death and criminal negligence causing death. SUNSET HILLS, MO (KTVI) – A cyclist claims the mayor of Sunset Hills ran his car into him knocking him off his bike on purpose. The mayor claims that’s not true and insists the cyclist started it all. Sunset Hills Police are investigating which has the cyclist’s lawyer crying foul. Murdick said his achilles tendon was torn, and he was badly bruised plus his $12,000 dollar bike was damaged. 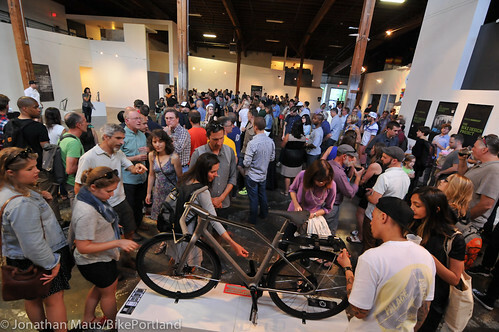 The “Solid” bike drew a crowd at the big reveal party Friday night. What happens when top design firms are paired with expert bike makers and told to create the “ultimate urban utility bike”? 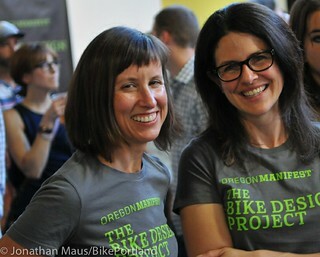 Thanks to the Oregon Manifest Bike Design Project we now know the answer to that question. Holt (L) and Jocelyn Sycip. On Friday night, teams from five cities — New York, Seattle, Chicago, San Francisco and Portland — revealed their designs at five simultaneous parties. It was the climax of an eight-month collaborative process that took city bike design and engineering into completely new territory. The organizers behind this competition believe that urban bikes get the short end of the R & D stick in the U.S. bike industry. “We think it’s the most important — yet least evolved category,” said event co-founder Shannon Holt, referring to the low priority city bikes are given (compared to racing bikes) by major bike brands. Holt and her partner on the Manifest event, Jocelyn Sycip, hope the designs created in this competition will influence U.S. bike makers and convince them to take city bikes more seriously. To put a finer point on their goal, they inked a deal this year with Fuji Bikes who has agreed to mass-produce the winning bike. Instead of a judging panel like years past, this year’s winner will be decided by a public vote. Voting opens today and goes through August 3rd. At Friday’s party, we saw the Portland entry for the first time. It did not disappoint. 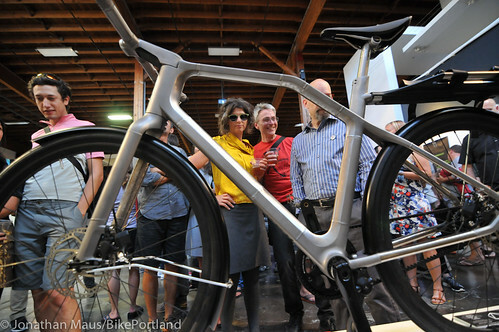 Dubbed “Solid,” by the team of Industry and Ti Cycles, the bike drew lots of attention. 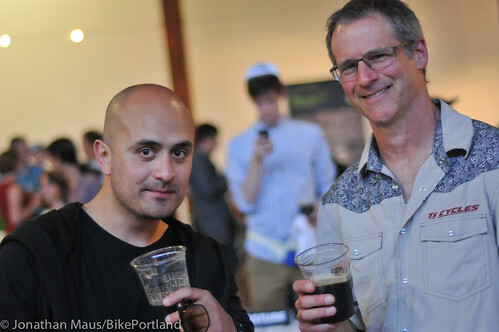 Oved Valadez, founder partner of Industry, and Dave Levy, owner of Ti Cycles. Even if you’re not from Colorado, you are likely familiar with the amount of large mountains that engulf the state. Specifically mountains that reach 14,000 feet in elevation and above. There are 89 mountains that are 14,000 feet or higher in the United States, over half of those (53) peaks are in the state of Colorado. Even more outstanding is that there are at least 600 additional mountains that range anywhere from 13,000 feet to 13,999 feet in the state of Colorado. People have long enjoyed climbing these peaks, and many people set goals to climb all 14ers in their lifetime. Some people, however, are just not satisfied with simple goals. In the case of adventurer Justin Simoni, he is taking it to an extremely different level. On Friday, July 25th Justin set out on a challenge that will consist of not only climbing each 14er in colorado, but doing so self-powered, and self-supported. In laymen’s terms, he is doing it all himself, non-stop until each peak is reached. So how is he getting around? It isn’t like each 14er is within close proximity to the next. In addition to hiking, Justin will be cycling from trailhead to trailhead, via pavement and dirt, with everything loaded on his bike. Justin’s goal is to beat the fastest known time (FKT) of the fully self-supported “tour 14er”. The FKT was set in 1995 by Roy Benton at 37 days and 12 hours, and is believed to be the only other person to attempt and record this adventure. Justin has been living in the Denver area since he was 18, an artist and a cyclist. He has been trying to make ends meet while still having the freedom to do what he loves. 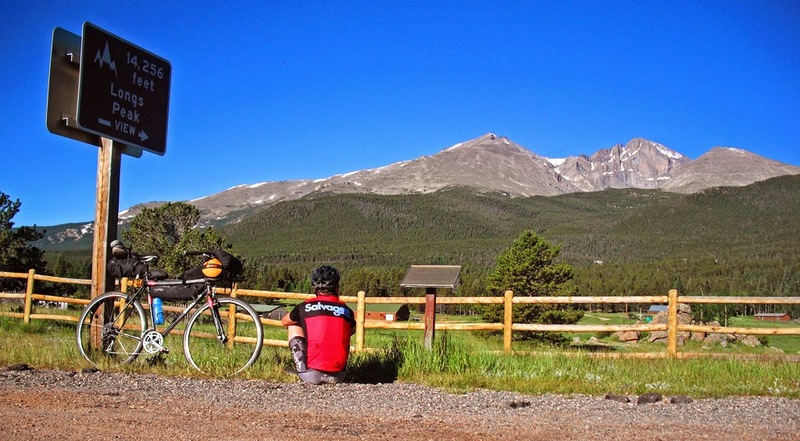 In 2011 Justin attempted the Tour Divide, but did not finish. In 2012 he came back and was the first single speeder to cross the line with a time of 23 days, 5 hours. Between his cycling hobby and active colorado lifestyle, he seems to be the perfect fit to take on this challenge. Justin started in Golden at the American Mountaineering Center at 4:00am on Friday, July 25th. He has planned out a route where he will head in a clockwise direction with Pikes Peak being the first 14er. From there he will head south to summit the Crestone Peak and needle, by far one of the most difficult portions of his journey. The sins of a few projected on to the many is one of factors that leads to an irrational hatred of cyclists. You really don’t have to go very far on the internet before finding this sort of stuff. Using search terms ‘cyclist’ and ‘road tax’ on Twitter, for instance, will bring up lots of unbidden hate, or follow @cyclehatred which is a collection of comments from Twitter users who feel it's socially acceptable to write "get off my road" threats against cyclists and joke about knocking into, and even killing, cyclists. The highly ingrained beliefs that “all cyclists run red lights” and “all cyclists ride on the pavement” - even though motorists do the same - are part of the problem but the hatred goes deeper than that. It's irrational prejudice, and that's why in The Times yesterday, Edmund King, president of the AA, said invective aimed at cyclists was a "road safety issue." King has long argued that motorists and cyclists are often the same people and that the 'them and us' mentality must be eradicated. Animosity shown by cyclists to motorists, and by motorists to cyclists, needs to end. He said: "When we release our grip on the steering wheel or handlebars, the differences disappear." 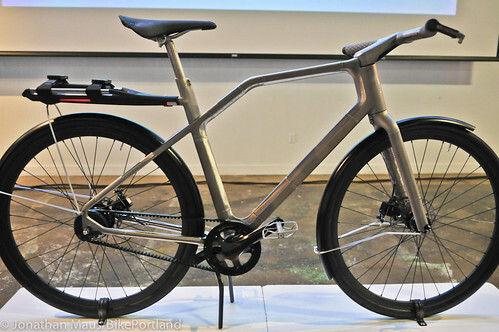 This design envisions a bicycle that can be simply assembled or taken apart in 10 minutes. Hope you're good with a socket wrench. If you've ever brought a bike along on a flight or packed up the parts to ship across the country, you know that trying to move a bike around is expensive. It also tends to slightly offset some of the environmental benefits of riding, since a box holding a bulky frame takes up a lot of space on a delivery truck. That's why this new design concept shrinks down a bike so it fits in a backpack. "Conventional bikes are awkward in every way except when you ride them," says Amit Mirchandani, managing and creative director for Lucid Design, the India firm that designed the new bicycle. "The Kit Bike is so small when disassembled it fits in a bag you could carry as a backpack. When you assemble the bike, you get a full-size bike that is comfortable to ride." The bike frame is made from hollow aluminum tubes that twist together and can be secured with a key. Since the frame attaches only on one side of the wheels, the bike can be assembled and disassembled while it leans against a wall. When it's not in use, the parts and wheels can each be stowed in sections in a custom-designed bag. "We tried to make assembly as simple as possible," says Mirchandani. "We could make it even simpler, if we were to take this idea further, by clearly marking connectors with graphics. I would imagine that you would need very little mechanical skills to put this together. We believe it would be easier than most flat-pack furniture." Way had swiped a 29-year-old with her side mirror, “sending him off the bike and into the trees where he was banged up, but wasn't seriously injured,”Jalopnik reports. Way didn’t stop, and the cyclist only came forward to cops after Way’s tweet went viral. (He didn’t want his girlfriend to worry and start putting his bikes on eBay.) Way repented—after local police found her tweet and she was suspended from her job.